Robert Arthur and Glenn Torkells were sitting in the principal’s office. I read Professor Gargoyle and The Slither Sisters back-to-back, so I thought I would review them in the same way. Once again, The Slither Sisters provides a quick, fun read for the reader, without them having to think too much about it. It’s a great book to read between something more dense, and if you’re just in the mood for something fun and slightly silly. Let me say it again: I love the drawings in this series. 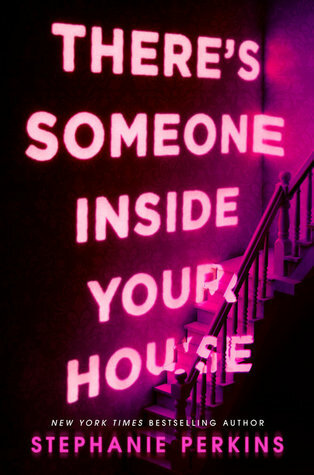 They definitely add something to the story, and the way this book is put together is so creative. It adds to the overall quirky appeal. We learn a lot more about Lovecraft Middle School’s background in The Slither Sisters. We see a bit of how the school works, and who else is involved with the bad guys. It was all really interesting, although at times it was a bit of an infodump. 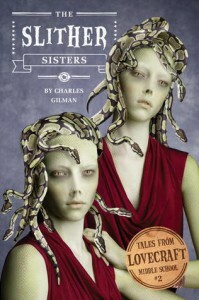 The Slither Sisters is such a short book that I think it would have been difficult to improve the pacing of the infodump, especially as Gilman had characters and a storyline to develop. All in all, that part wasn’t unbearable. There was a twist at the end that I didn’t see coming at all. I probably should have done, because it was similar to something that happened in Professor Gargoyle, and while there were no actual clues, I should have picked up on the trend. My Sherlocking skills failed me on this one, and when the reveal happened I actually laughed out loud. It was surprising, and it made me crave the third book in this series. I’d definitely recommend picking up The Slither Sisters if you’re looking for something quick and highly enjoyable. I’m going to have to add the third book to my to-buy list for November, because I am really excited to discover more about Lovecraft and its students! I haven’t read this series, but it sounds right up my alley so I’ll have to check them out soon. Great review, Amber!